The VH Audio Flavor 3 power cable is designed for digital and video components that DO NOT require a safety ground. To determine if your component requires a safety ground, simply unplug your current power cable from the back of your component and see if there are two or three male IEC prongs on the component. If there are 2 prongs, then this is the appropriate cable for you! * Two 12 AWG low strand count bare copper conductors for very low resistance. * Deep Cryogenic treatment of the power conductors and the connectors (using standard WattGate connectors). * FEP insulation of all conductors, including the outer protective jacket. * 100% shield coverage. This cable has both a foil AND braided shield, which effectively reduces RFI/EMI. This is important for keeping grunge out of the cable, but even more importantly to keep it localized within the cable and harmlessly drained to ground. 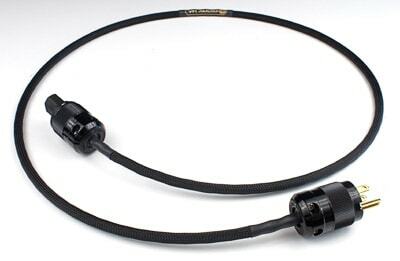 * The entire braided shield is about 12 AWG, providing a low impedance drain to ground. * Twisted pair geometry with tight lay length (twists per inch) provides excellent RFI/EMI rejection, and also reduces the inductance (raises capacitance). * The wire termination points are treated with "TPC- The Perfect Connection" contact enhancer before termination. * Deep Cryogenic treatment of conductors is standard. Cryogenically treated WattGate brass plugs are included in the standard cord price. Connectors available at additional cost include Furutech's FI-11, FI-25, U.K. and Schuko series, as well as WattGate's 330 and 350 series.